Jigsaw is one of the most practical and versatile power tools which you could own in your workshop. From making precise straight cuts, you can use this tool to make a wide range of unique cuts including curves, circular cutouts, inside openings, furniture trimming and much more. Depending on the type of the blade which comes integrated into your preferred jigsaw, it can be used on different types of materials ranging from wood to even ceramic tile. There are two types of jigsaws which are available in the power tool marketplace: cordless jigsaw and corded jigsaw. When the former type is designed for the ease of use, as you can easily carry it from one place to the other without worrying about the cord, the latter comes handy in the higher end applications. In the below-mentioned guide, we’ve compiled the best jigsaw 2019 models which you can purchase from today’s market. 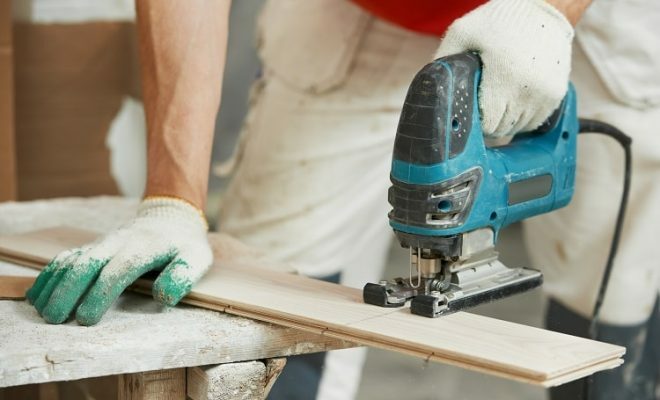 It includes both cordless as well as corded units so whether you want to add a new jigsaw tool to your DIY Project or even if you’re looking for a professional-grade jigsaw, everyone can find a model best suited to his needs. Featuring a Li-Ion Battery, the DEWALT DCS331B is ideal for all those contractors who want to use their jigsaws for small to medium-sized projects. Weighing 6lbs, this model features convenient dust blower which makes sure that your workplace remains tidy even after several hours of woodworking projects. Lastly, it can make bevel cuts up to 45 degrees with positive detents at 4 common angles. For making it a versatile product, one which can be used on a number of different materials, the manufacturer has designed the DEWALT DCS331B with a Variable Speed Control. Starting from 0spm, you can adjust its speed up to 3000spm with the help of the trigger. For example, if you’re going to cut a material which requires precise cuts, you might want to press the blade a little softer for slow speed. However, if the desired material is aluminum or even metal, you can always generate greater power with the help of the trigger. As a result, you’ll have the desired accuracy for cutting through wood, aluminum and other such materials with the DEWALT DCS331B. The DEWALT DCS331B incorporates a keyless blade which incorporates all-metal construction. When such a mechanism makes it extremely easy to replace the blade, as you don’t need any kind of tools for this purpose, its durable edifice makes sure that this blade won’t get damaged for a consistent duration of time. The DEWALT DCS331B is equipped with a 4-position Orbital Action which allows you to have full control over your cut quality. If you want to make a precise cut, you can choose the 1st position which is designed for straight cuts. But if you’re looking to make aggressive cuts on slightly thicker materials, you can also choose higher settings. 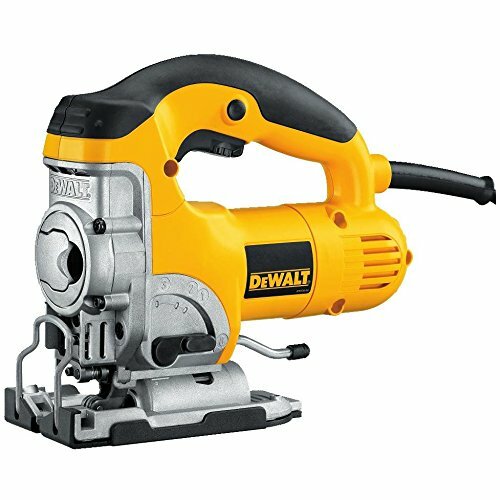 One minor drawback, which can be associated with the DEWALT DCS331B is the fact that it comes without the Li-Ion battery and charger. So you’ve to purchase both these accessories on your own after making this acquisition. If you’re looking to purchase a cordless jigsaw with slightly improved cutting capacity, the DEWALT DCS331B can be your ideal purchase. Backed by DEWALT’s 3-year warranty, this product is very easy to control thanks to its anti-slip grip design. Moreover, its variable speed control ensures that you’ll have enough power for making precise on different types of materials. 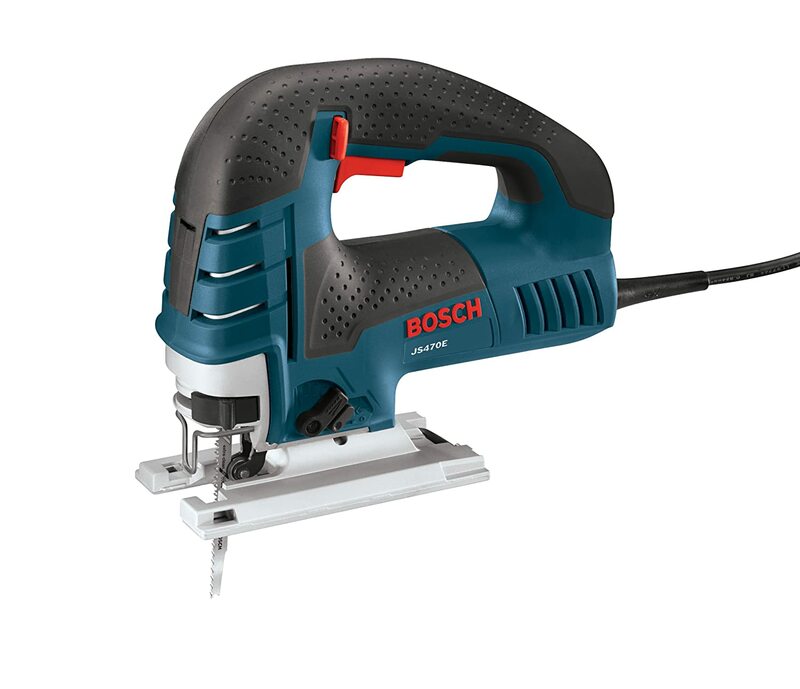 The Bosch JSH180B is ideal for all those woodworkers who’re looking for a lightweight and user-friendly jigsaw. Incorporating T-shank blades, this model comes with a tool-less blade change mechanism which allows anyone, even without prior experience, to replace the blade. It features a 45-degree beveling capacity and with a 1’’ stroke length, you can use this unit on wood, steel or even aluminum. The overall weight of the Bosch JSH180B is as low as a mere 5.2lbs which makes it one of the lightest products in this category. In fact, as compared to a majority of other cordless jigsaw reviews, this model is 30% lighter for the user’s convenience. Furthermore, it comes with compact dimensions which makes it pretty easy to handle. So when you can easily carry this unit from one place to the other, you can store it as well without any hindrance. As already mentioned, the Bosch JSH180B incorporates a T-Shank Blade mechanism which is of great virtue when it comes to replacing one blade with the other. All you have to do is just to turn the knob, which is designed at one side of this jigsaw, and it will eject the blade. It means that when you can replace the blade at the end of the day, you can also change the blade in the middle of the job. The reason behind it is when you don’t have to touch the blade, even a hot blade can be replaced without much hesitation. As per inserting the new blade, you can do so with just one hand. The manufacturer has designed a built-in LED Light in the Bosch JSH180B so that the owner of this model can enjoy a clean line of view. Not only it illuminates the work material but at the same time, it also allows you to work on this cordless jigsaw round the clock. For making sure that you can use this jigsaw for years to come, the Bosch JSH180B comes integrated with an Electronic Motor Protection. This feature basically protects the motor from getting overheated which eventually enhances the lifespan of this equipment. One thing which you’ve to keep in mind is that the Bosch JSH180B comes as a Bare Tool. In simple words, you’ll only get the Jigsaw in this purchase and when it comes to the Li-Ion Battery and the charger, all of them needs to be purchased separately. If you’re looking to purchase a Jigsaw which is extremely easy to use for beginners as well as expert woodworkers alike, the Bosch JSH180B. This model comes with a minimal grip diameter and when it is one of the lightest products in its category, it also comes with a 30-day money back guarantee. Powered by an 18-volt Lithium-Ion Battery, the Makita XVJ03Z comes from one of the premium manufacturers in the field of power tools. When Makita has built a reputation of manufacturing high-quality power tools in the past, this is yet another superb quality product from this particular manufacturer. This cordless jigsaw features a maximum output of 2600 spm and when it comes with no less than 3 orbital settings, it makes it more than capable of dealing with a wide variety of materials. For added convenience, it has a tool-less blade change mechanism and when the overall weight of this unit is just above 6 lbs, you can use it for as long as you want without feeling any kind of fatigue. The Makita XVJ03Z incorporates a Variable speed motor so depending on the materials’ thickness, you can increase or decrease the speed of this unit. A variable speed trigger is provided for this purpose which, for added safety, needs to be operated by a couple of fingers. Such kind of construction is viable for all those of you who’s going to deal with different materials in their workshop. In addition, it also enhances the lifespan of this jigsaw so after making this purchase, you don’t have to purchase another cordless jigsaw in the near future. Apart from the straight cutting feature, the Makita XVJ03Z incorporates 3-orbital settings which ensures that you can match the cut with the material under consideration. For example, if you’re working on a delicate piece which requires precise cuts, you can choose the first orbital setting. However, if the material which needs to be cut is quite dense, you can always choose the coarse cuts. For making it easy to change from one orbital setting to the other, an easy-to-use-lever is provided on the side of this jigsaw. You just have to flip the lever, on your desired cut setting, and this unit will be ready for your next cutting job. There is no Jigsaw, available in the market, which you can use for 10 decades. However, when it comes to Makita XVJ03Z, the manufacturer is quite sure that this product has got all it takes to withstand rough usage for at least 3 years. So you’ll get a 3-year warranty on purchasing this one of the best jigsaws. 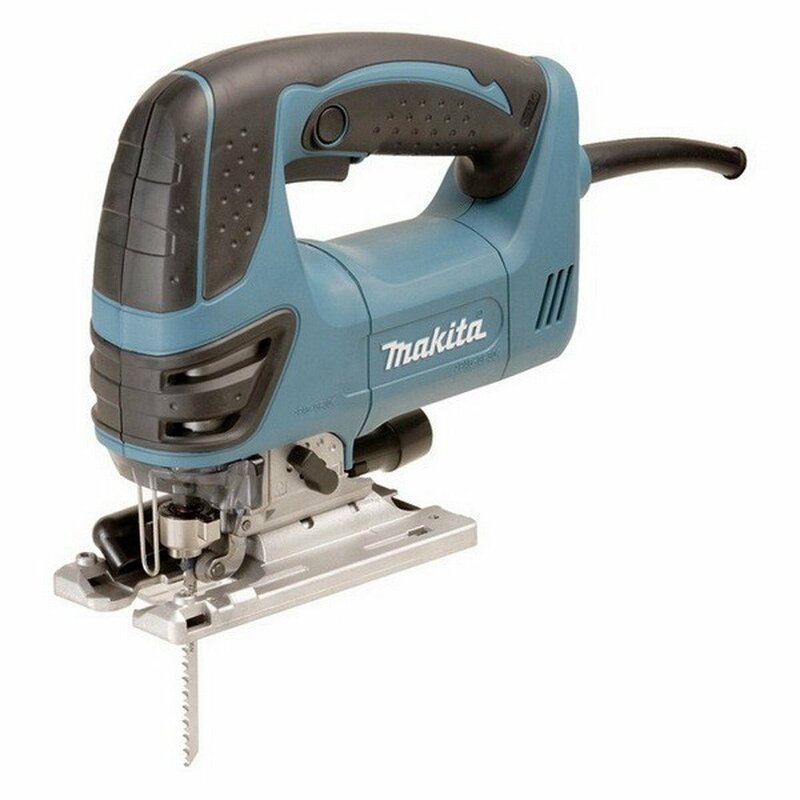 There are no batteries or charger included in this purchase as all you’ll get is the Makita XVJ03Z Jigsaw. So make sure to purchase them separately apart from making this acquisition. If you’re looking to purchase a Jigsaw for your daily DIY tasks, the Makita XVJ03Z is one of the best cordless Jigsaws in this category. With a powerful motor along with an impressive output, the fact that you can even alter its speed, as per the material’s thickness, makes it quite a versatile cutting tool. One of the least expensive products in this list, the PORTER CABLE PCC650B is ideal for all those woodworkers who’re looking to make this purchase without breaking their budget. Despite its low price tag, this model still comes with a number of hi-tech features, including 3 different Orbital Settings along with a variable speed trigger, so you don’t have to worry about the functionality of this model. In addition, it is covered by a 3-year manufacturer’s warranty. The PORTER CABLE PCC650B is powered by a 20 Volt Li-Ion Battery which is capable of holding the charge for up to 18 months. This battery allows this model to produce a maximum power output of 2500spm. I comparison to other cordless jigsaws which come within this price range, this is a much more powerful model. The PORTER CABLE PCC650B is equipped with a variable speed trigger which allows you to adjust its speed from 0 – 2500 strokes per minute. When a low speed is adequate for cutting softer materials, the higher end comes handy if you’re going to handle dense materials in your workshop. Just like a majority of other products on this list, this battery jigsaw features a tool-less blade mechanism. It makes it pretty easy to replace the blade and that too in a very short span of time. You just have to remove the battery before pressing the little red tab on the underside of this model. After you do that, the blade will instantly come out and you’ll have to follow the same process all over again for inserting the new blade. 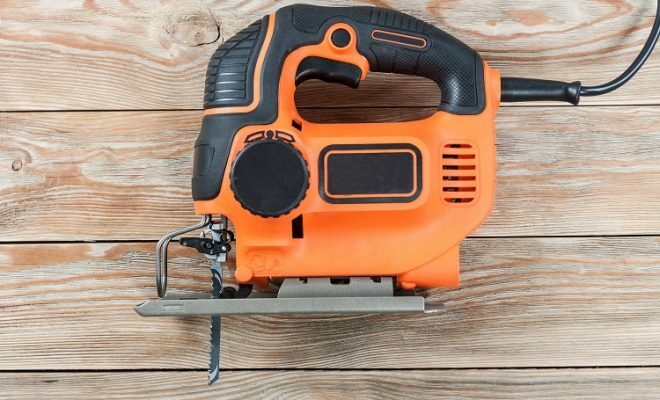 It means that unlike a majority of cordless jigsaws, you don’t need screwdrivers or hex wrenches when it comes to replacing the blade of this particular unit. Having said that, this model comes without a charger and battery so you cannot operate this Jigsaw as long as you purchase these two items separately. 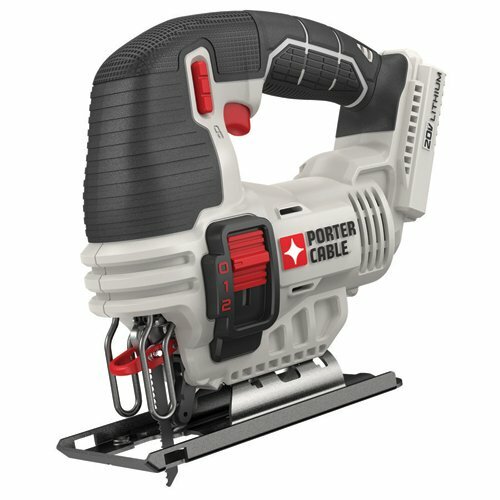 If you’re looking to purchase a cheap jigsaw, one which combines affordability with performance, the PORTER CABLE PCC650B is definitely worth a shot. Apart from a decent set of features, it also comes with a 4’’ wooden blade which gives you a decent value for money. Additionally, the overall weight of this unit is just 4.1lbs which means that you can operate the small jigsaw without feeling any kind of fatigue. The DEWALT DW331K is designed to withstand the extensive workload on your job site. For optimal performance, this power incorporates a variable speed control which allows it to produce just the right amount of strokes even for the toughest applications. 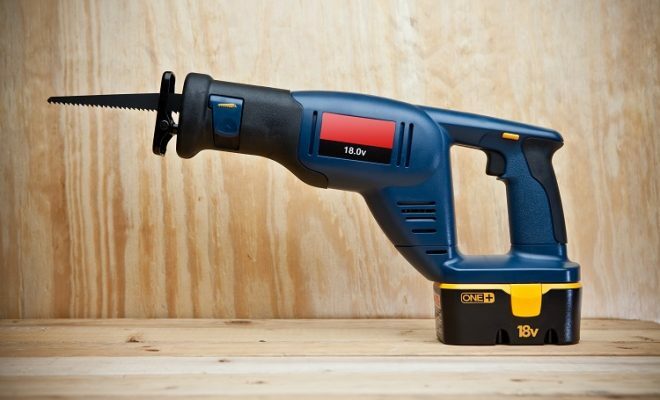 It is also a pretty lightweight unit as the overall weight of this corded jigsaw is just 6.4lbs. 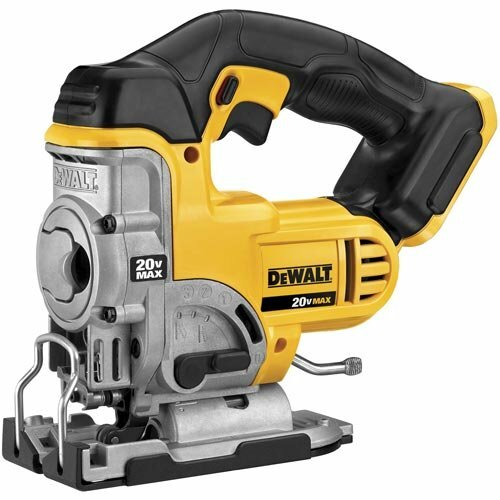 DEWALT is also offering a 3-year limited warranty along with this jigsaw power tool which is a further assurance of the quality of this purchase. The electric jigsaw features a wide range of stroke adjustments as starting from 500spm, you can adjust this tool to work at 3100spm. It comes with a 1’’ stroke length and depending on the type of the blade, you can use it on both metal sheets as well as other woodworking applications. For adjusting strokes per minute, the DEWALT DW331K comes equipped with a speed lever. This lever is designed on one side of this jigsaw cutter which means that it isn’t easy to adjust the speed. However, if you’ve used some handle-top jigsaws in the past, you might be aware of the fact that almost all of that equipment operates in a similar way. The DEWALT DW331K works on T-shank blades which have become an industry standard in the past few years. When a majority of contractors and DIY users work with this type of blade, it makes it pretty convenient for a wide range of customers. Furthermore, changing the blade is quite easy as all you have to do is to manipulate the blade lever. It means there is no need to purchase additional screwdrivers which make the DEWALT DW331K a pretty convenient Jigsaw machine. 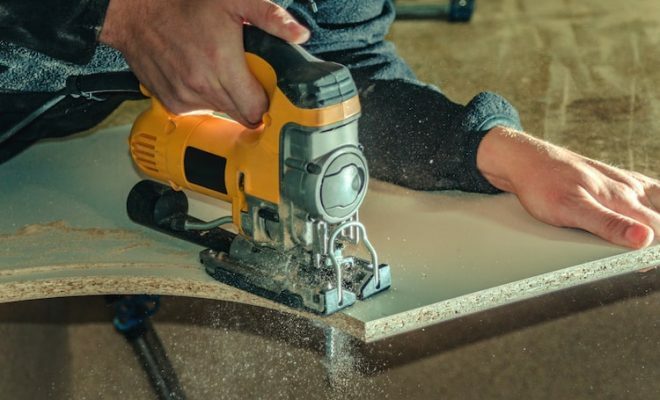 If you’re looking for the best jigsaw 2019 designed for heavy-duty applications, the DEWALT DW331K is worth a try. Featuring a powerful motor along with variable speed adjustments, this unit comes with 4 orbital settings so you can use it for cutting a wide range of materials. Featuring a powerful 7-amp motor, the Bosch JS470E is designed for all those contractors and serious DIYers who’ve to work with a number of different materials in their workshop. Starting from different types of wood, you can use this product on aluminum or even mild steel. Equipped with a wide range of Strokes-per-minute, this handheld jigsaw can also be used to make bevel cuts within the range of 45 degrees. Furthermore, its adjustable dust blower makes sure that you’ll always have a clear line of sight. One thing which impressed us the most about the Bosch JS470E is its unmatchable power. Featuring a top-handle design, the 7AMP motor helps you to power through the thickest of materials. Bosch JS470E jigsaw incorporates an SPM range of 500-3100 which can be adjusted with a variable speed dial. Combine it with its 4 different Orbital-action settings, you’ll have adequate power to cut through wood, aluminum, and mild steel. For making it a user-friendly equipment, Bosch has designed a unique lock-on button in this particular tool. Now what it does is that once you engage this button, you can work with this jigsaw without even pressing the trigger. It means you can adjust your hand for precise cuts without worrying about having to deal with the trigger. For making sure that you can work with a clear line of view, the Bosch JS470E incorporates an adjustable dust blower. It basically keeps the dirt and debris away from your material which means that all these materials won’t interfere with your viewpoint. 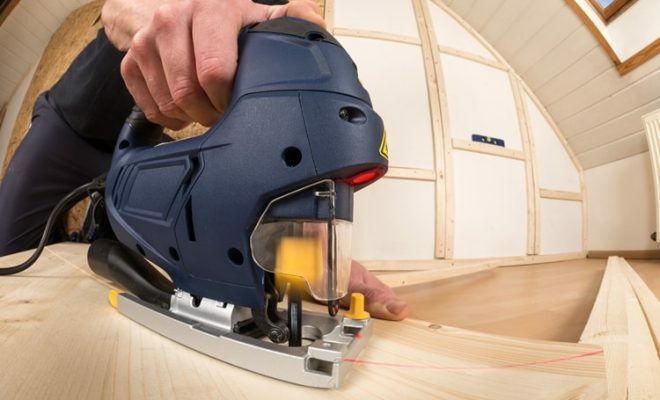 This particular feature is designed for all those carpenters or other Jigsaw users who have to deal with materials of different types of thickness on a daily basis. The Bosch JS470E features 4 different orbital action settings which are pretty easy to adjust. Depending on whether you’re working with a softer material or if the material which needs to be cut is a bit dense, this particular feature allows you to select the right type of blade stroke. Lastly, this jigsaw also comes with a carrying case which makes it easy to transport from one job site to the other. 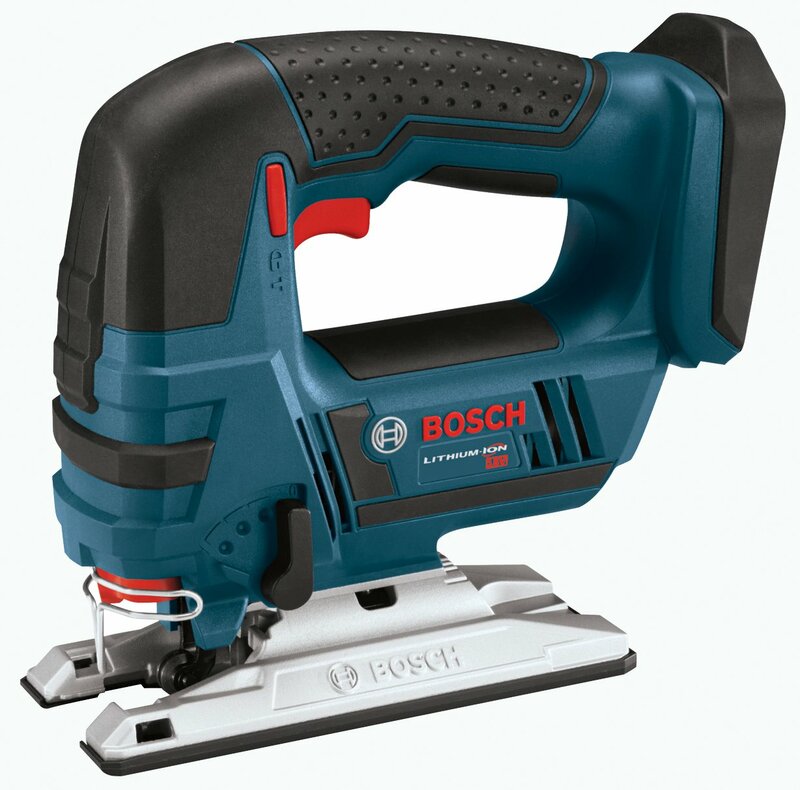 If you’re looking for the best corded jigsaw, one which ensures high-quality performance on a consistent basis, the Bosch JS470E is worth a shot. Equipped with a powerful motor, this product comes with a convenient blade change mechanism along with 4 Optimal-action settings for optimal performance. Incorporating a top handle design, the Makita 4350FCT consists of a set of unique features. First of all, it is one of the very few corded jigsaws which features a built-in LED Light. Then comes the Soft start feature which makes sure that you don’t have to suffer from unwelcome startups. Additionally, this model is designed in such a way that it produces 40% lesser vibrations as compared to a majority of corded jigsaws in today’s market. And when it comes with a variable speed control, it makes it an ideal purchase for carpenters, remodelers and other types of woodworkers. The Makita 4350FCT incorporates an LED Light which is a must-have for all those woodworkers who doesn’t want to compromise on the accuracy of their work. With this feature, you can easily place the saw on its preferred position without changing your position one bit. This is especially beneficial when it comes to making contoured cuts because as compared to other woodworking tasks, this particular job requires utmost precision. 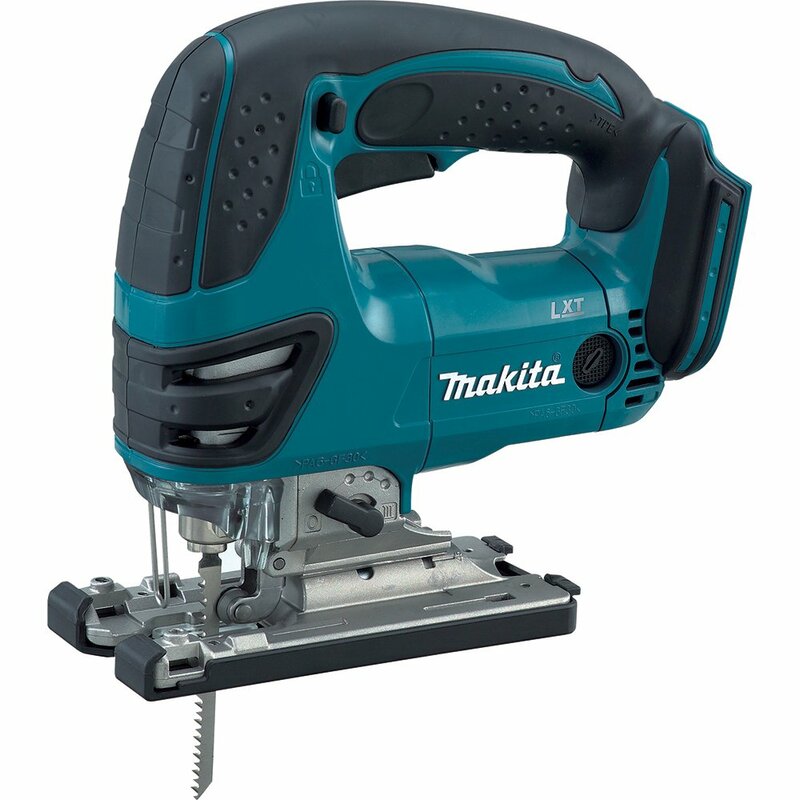 The Makita 4350FCT comes with an impressive cutting capacity on both wood and steel-based applications. When it comes with a maximum cutting capacity of 5-5/16’’ on different types of wood, you can use it to cut up to 3/8’’ on the steel. All of this is made possible by the 1’’ stroke length of this material which, when combined with the 800 to 2800 SPM range, makes it no less than a breeze to cut through different materials. You can also make bevel cuts with this jigsaw as it comes with a 0-45 degrees bevel range on both sides. All you have to do is to use the hex wrench, which comes included with this purchase, for tilting the aluminum base. The overall weight of the Makita 4350FCT is just under 6lbs which makes it easy to operate. For your convenience, this model comes with a rubberized grip handle which prevents you from feeling any kind of fatigue. Then comes the lock button which makes sure that you can work for as long as you want without pressing the trigger. Another exciting feature is the inclusion of built-in dust blower which ensures added visibility. In addition, it comes with no less than 6 different blades so you don’t have to purchase a new one in the near future. The Makita 4350FCT is designed for all those woodworkers who want maximum cutting capacity in their preferred cutting tool. In addition, it comes with an LED Light which not only enhances your line of sight but it also gives you the change of working under low-light. And lastly, you don’t have to worry about the quality of this acquisition because it is covered by MAKITA’s 1-year warranty. Incorporating a barrel grip, the Festool 561443 is designed to make your cut quicker, easier and with much more precision. Equipped with a 6AMP motor, the handheld jigsaw incorporates a staggering spm range from 1000-9000 strokes-per-minute. As compared to a vast majority of jigsaws, this is the fastest power tool which means that regardless of the density of the materials in your workshop, the Festool 561443 will cut right through it without any hindrance. For making sure that the owner of this jigsaw will always make precise cuts, the manufacturer has designed the Festool 561443 with a patented triple blade guidance. It consists of a couple of metal guides along with a single metal wheel as all of them combine to keep the blade from any kind of deflection. Starting with the metal guides, each one of them is provided at one side of the blade. If the blade tends to move one side or the other during the course of operation, these guides prevent it from doing so without coming in contact with the blade. In addition, you can also adjust the distance manually between both these components. As per the metal wheel, it is provided on the blade’s back side. It basically provides lateral stability to this component apart from supporting it from behind. As a result of such a flawless mechanism, you can be extra sure that the Festool 561443 will perform extremely well on the job site. The plastic chip guard, which comes in the T-LOC Systainer, makes the Festool 561443 a standout performer. You just have to install the chip guard into this power tool’s base plate. Afterward, it will reduce the tear-out to such an extent that you can even make finish quality cross-cuts in materials like plywood. The Festool 561443 accepts T-shank blades. Apart from using a blade of this manufacturer, you can even use all those blades which comes from different manufacturers. Furthermore, it takes no more than a minute to replace the blade as this power tool comes integrated with a blade change lever. A simple pull of the lever will release the blade and for inserting a newer one, keep hold of the lever in its open position while injecting the new component. Once you have made sure that the blade is in its proper position, release the lever and it will instantly lock the new component in its ideal position. 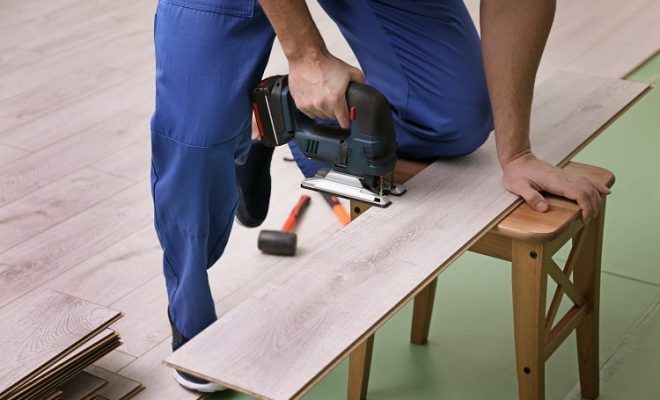 It means that even if you have to change the blade in the middle of your job, you can do so with the best woodworking jigsaw before getting back to your work in a matter of few seconds. 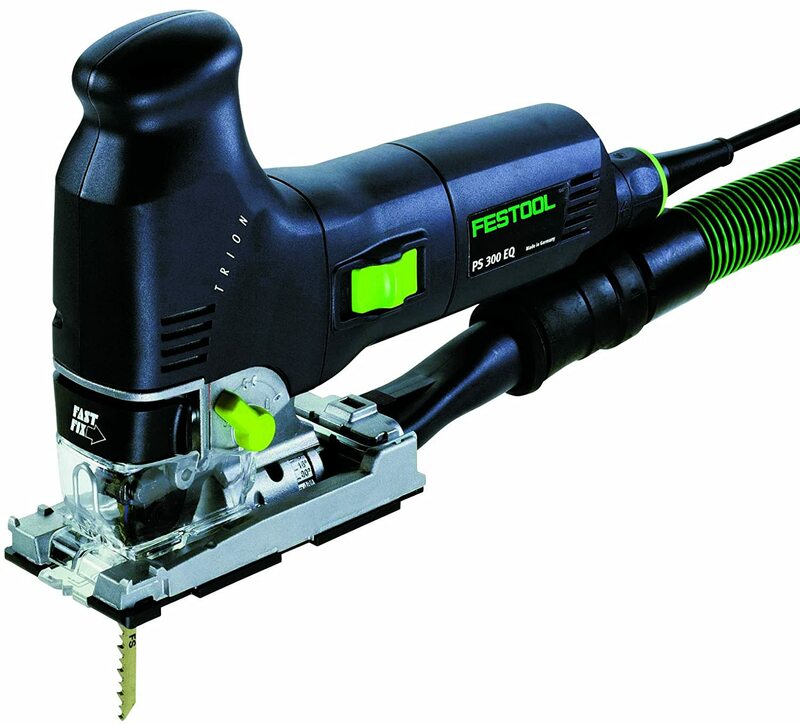 The Festool 561443 is one of the best jigsaws 2019 which you can purchase for heavy-duty woodworking applications. Having a superior blade guidance, it produces precise quality cuts on all types of materials. You can use it on wooden beams, aluminum or even steel and the manufacturer is also offering a generous 3-year warranty along with this power tool. Never use a jigsaw under wet environment. This power tool isn’t designed for this purpose, so make sure that your job site, where you’re going to use this equipment, is dry. 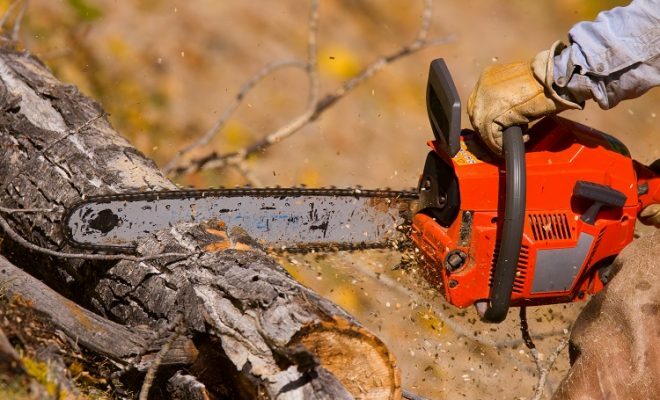 In addition, always wear safety glasses while operating with this type of saw and depending on the material under consideration, always use the blade which is designed for that type of cut. Eventually, it will greatly reduce the risk of personal injuries.